pregnant, I had to take it easier than usual. I unfortunately didn't make it to two shows because they were later in the day and I was just too exhausted to get out to them. I did, fortunately, made the most of the weekend and did a lot in three days! Day 1 for me kicked off with the Indonesian Diversity Fashion show. I love this collection, it is bold and bright and diverse! 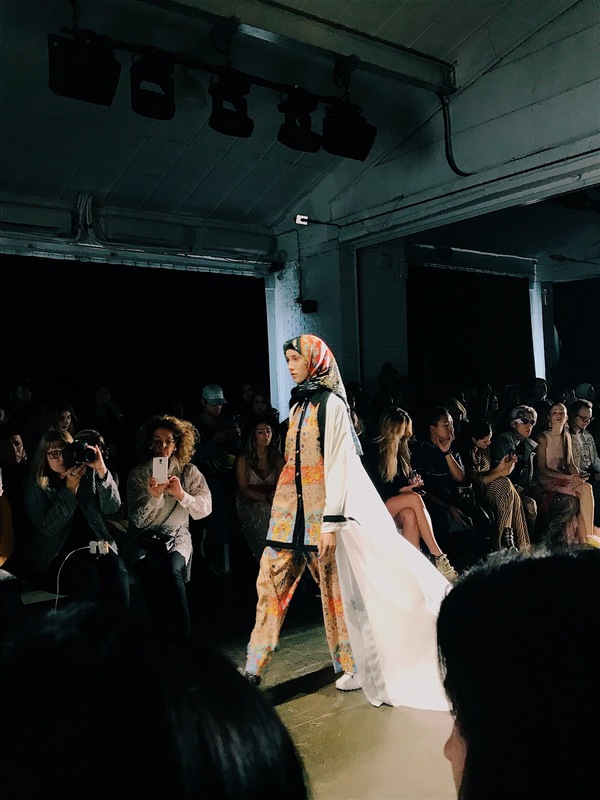 It is wonderful seeing hijabs on the runway. I grew up with family that always wore these and in the past, they would always get odd looks but it's nice to see that the world has become comfortable with strutting these on the runway. There were so many great pieces including the two piece suit below. Later that evening, I had the pleasure of attending the YSL Beauty Hotel. This immense townhouse in Soho showcased YSL's beauty launches in each room. There was also an indoor pool that allowed me to strut my stuff on the catwalk. In one room, my girlfriends and I had fun giving our best "face" while posing with guitars on a bed! 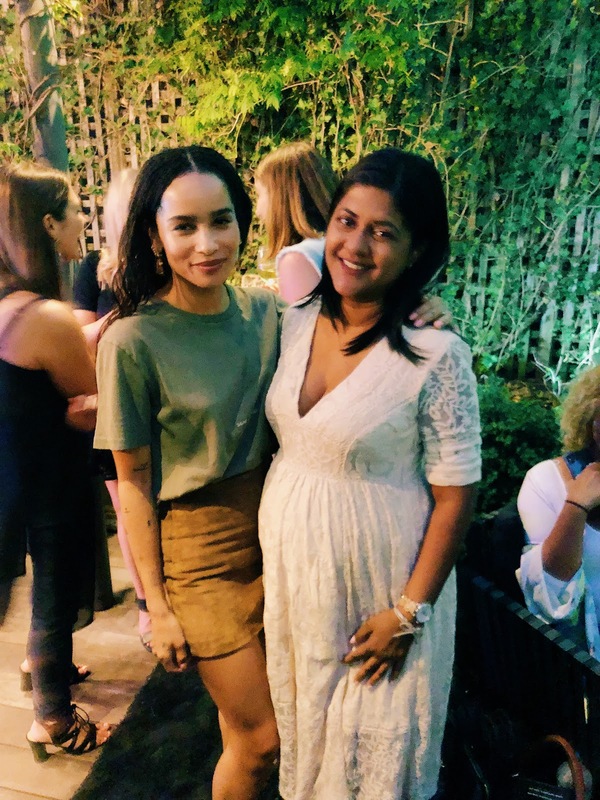 The icing on the cake was my opportunity to meet Zoe Kravitz. She is the face of their latest campaign for Black Opium Eau de Parfum. 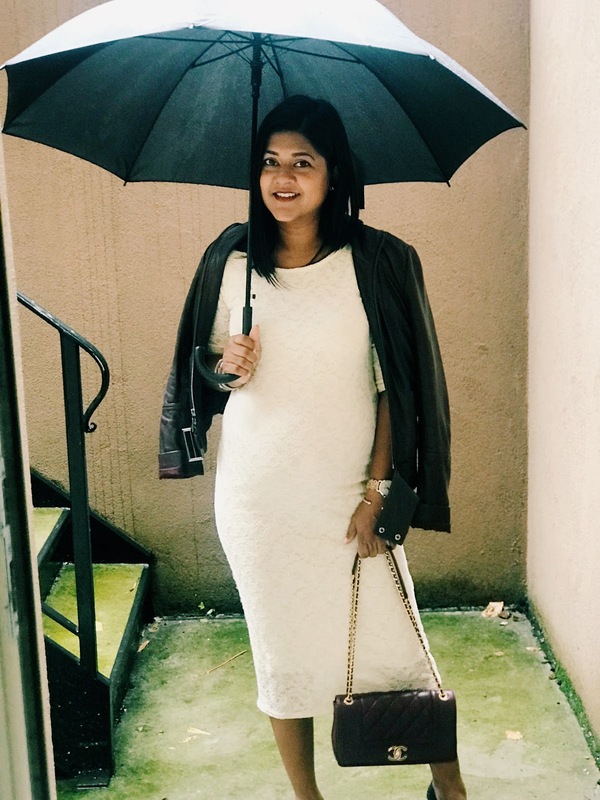 I wore a ivory lace tea dress from Free People that fit perfectly over the bump. 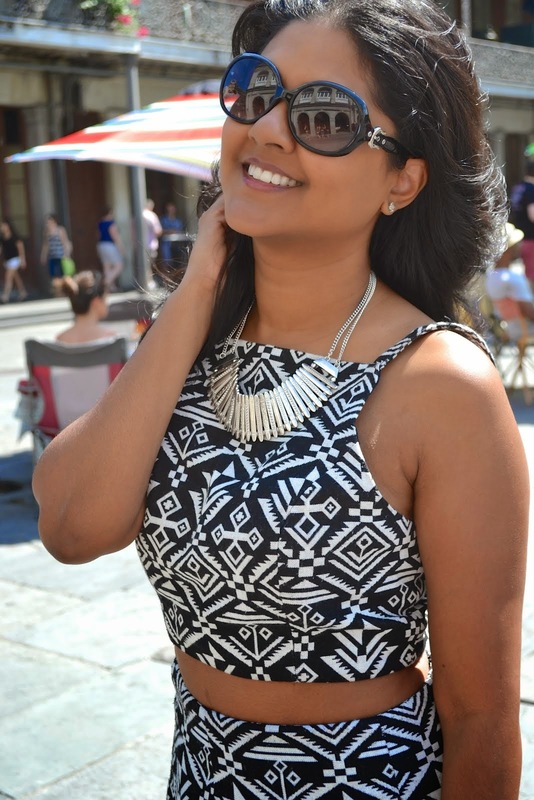 It was snug just right above my waist and flowed over my belly comfortably. Saturday, I attended the Son Jung Wan Fashion Show. The designers inspiration came from what she called "a dramatic move". This spring collection included soft florals that flowed effortlessly as well as the combination of lace and tulle that meshed together perfectly. The soft colors were contrasted by her black and white pieces that were expertly tailored. Her collection is romantic with a touch of edginess. After the show, I headed to the Shiseido Pop-up experience in Soho. This pop up celebrates the launch of their new makeup collection which is based on four textures reimagined, gel, inks, powders, and dews. Each room brings each texture to life where your senses get to play. In their last room, you have the opportunity to test out all the items from the new collection. I experimented with the different lighting in the various room while wearing a pink kimono-inspired dress. This beautiful and vibrant v-neck dress paired well with my pink color block sandals from JustFab. 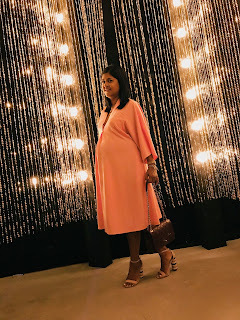 My fashion week experience this season ended on Sunday. 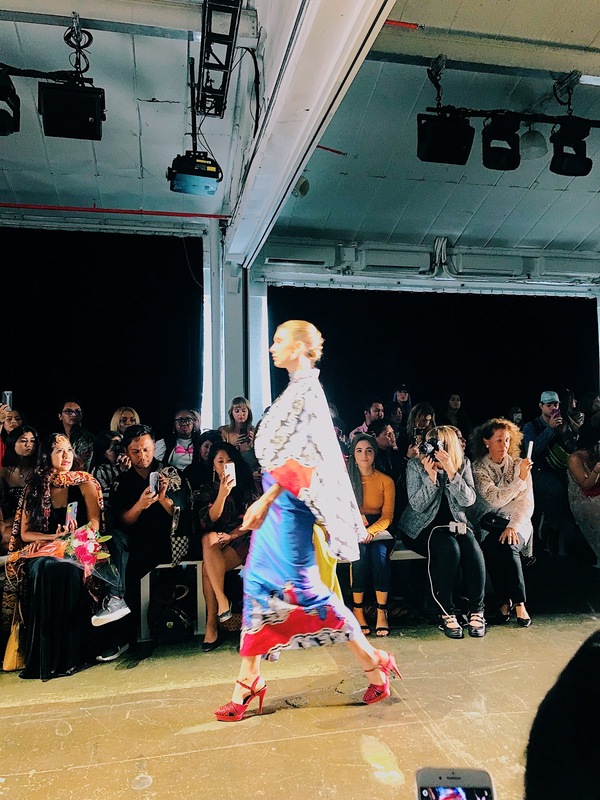 I attended the Nonie SS19 runway show and was extremely happy that I made it to this show and didn't let the rain stop me. I wanted every piece is this collection, it was sheer elegance. The soft fabrics draped elegantly on each model and the bold colors or red and black looked great on all models. This collection is filled with timeless, clean silhouettes in the finest silk. The skirts had rushed details that make them perfect for day to night ensembles. I wore my PinkBlush Maternity lace dress accented with my maroon leather jacket and purse. This show was a great way to end my fashion week experience.